It's time for a FIESTA! The Capitals just tied the series with the Rangers and the Nationals are well on their way to embarrassing the Phillies in front of tons of their fans. 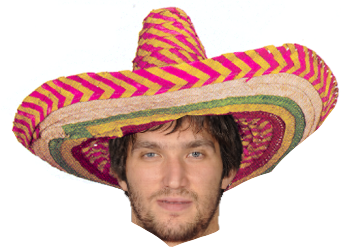 It really is DCinco De Mayo! The Caps are unbelievable. Towards the end of the season there was a question of whether or not the team would make the playoffs, and now all of a sudden they are tied 2-2 in the second round. The Caps defeated the Rangers 3-2 after Mike Green finally decided to take (and make) the open shot with 6 minutes remaining to seal the deal. The Cappys got goals from Ovi, Backstrom, and Green. Hmmm. Those three names look familiar. The Rangers series is so much less "cheap" than the Bruins series, which shows you that the Bruins were the antagonists in the a-hole department. This series is two teams playing hard hockey, no scrums, no shoving matches, no fighting. Just hockey. I love it. Game 5 in NYC on Monday! CANT WAIT!